A new report has emerged that Tesla has increased its capital for the upcoming Gigafactory 3 in Shanghai to about $680 million, up from the $15.8 million originally registered. In addition, Tesla Shanghai filings indicate that battery, drivetrain, and electrical and electronic components will be made at that manufacturing facility. These and other clues make for perfect timing for the Model Y to be produced in China. It’s not clear whether the batteries themselves will be made here, but Tesla CEO Elon Musk earlier indicated that they would. However, as recently as July, Tesla hadn’t roped in the obvious choice – Panasonic – for the Chinese operations. The Japanese electronics major said in July that Tesla hadn’t asked for its cooperation in Shanghai, but that it would be open to that option. Panasonic already makes batteries in China, but not the cylindrical cells that go into Model 3 and older Tesla EVs. Per Musk, the learnings from Gigafactory 1 will allow the company to build a 250,000-cars-a-year-capacity plant in China for as little as $2 billion. The $680 million in registered capital is a significant portion of that. A few weeks ago it emerged that the local government in Shanghai was helping Tesla secure funding from local banks. The report about the new amount of registered capital could be a result of a loan approval from one or more of the four banks that were named at the time. As for the timeline, the two years originally slated for Gigafactory to go into production might be on the generous side. Chinese expertise in modular construction is already well known, and if the machinery can be put in place as quickly, production may well start sometime next year. The timing of that would be perfect for the Model Y launch. Moreover, Model Y will be using the same platform as Model 3, so the learning curve on the new crossover won’t be as steep. Tesla Shanghai has already had job postings for key technical and engineering positions for a while now, so this combination of factors – and the fact that Tesla Motors Hong Kong Co., LLC already has a permit to build EVs without a local partner – should help speed things along. The only question that remains now is: who will supply the battery. Battery production needs to be close to the source, according to Yoshio Ito, chief of Panasonic’s automotive and industrial systems unit, and if Panasonic isn’t going to be Tesla’s battery partner in China, who will? It’s possible that Tesla is in talks with Contemporary Amperex Technology Co. Ltd. (CATL) or another local battery maker. CATL already exceeds Panasonic in capacity, and a deal with Tesla would mean moving into the mainstream passenger car segment, which is currently only a small part of its business. Getting additional investment wouldn’t be a problem, either, because CATL is now listed on the Shenzhen Stock Exchange with a market cap of approximately $20 billion. The company also recently raised $1 billion in funding towards new battery plants. The last consideration is the Chinese government. Tesla seems to be on their good side now even though the former was affected by retaliatory tariffs on U.S. imports, which forced a price increase for Model S and Model X. If the local Shanghai government went so far as to aid Tesla in getting the funding it needs for Gigafactory 3, it’s very likely that they’re helping in other areas as well, such as greasing the wheels of bureaucracy to get permits and other regulatory requirements out of the way quickly and painlessly. One thing needs to be kept in mind, though. Model Y demand is still an unknown factor. Since the platforms for both Model 3 and Model Y are the same, a portion of the factory’s capacity could be allocated for Model 3 production for the local Chinese market. It makes sense because current tariffs on imports put a spanner in the works for Model 3 to truly go mass-market. China is the largest EV market in the world, and putting out a low-cost EV like the Model 3 with 200+ miles of range while also meeting the future demands of Model Y – which may be priced equally low with comparable range – would help Tesla have one foot in the sedan segment and one in the crossover SUV market in the largest auto market in the world. Plans for a Model Y are fuzzy at the moment as Tesla puts most of its focus on Model 3 production and Q3 profitability, which goals may already be on target to be achieved in light of Musk’s recent email to employees. The recent “exclusive delivery experience” event saw hundreds of cars fly off the lot at the Fremont factory, and the higher-priced P3D and Dual Motor versions were the first to go, so there’s movement on all sides: production, deliveries and profitability. 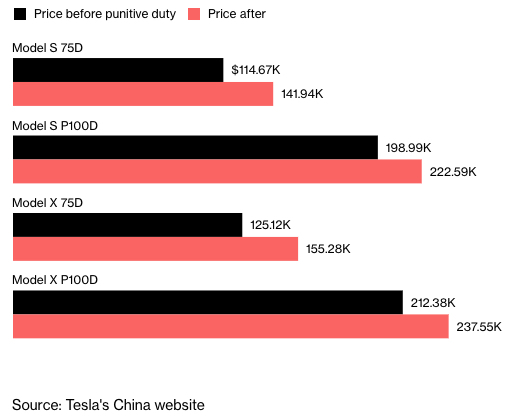 If the Model Y does get made in Shanghai, it will be interesting to see what it costs in the U.S. should it be made immediately available there. Base price is estimated at slightly under $40,000, but if imported to the U.S. it could carry a 25% premium, similar to the S60 sedan from Volvo and the Buick Envision.